Stitch n Purrl: And We're Off! I've joined Ravelry's Tour de Fleece this year, and yesterday was the start. The tour runs the same amount of time as the Tour de France, with rest days, challenge day etc. The main aim of the spinning version is to have fun, spin each day and post your progress on the forum. 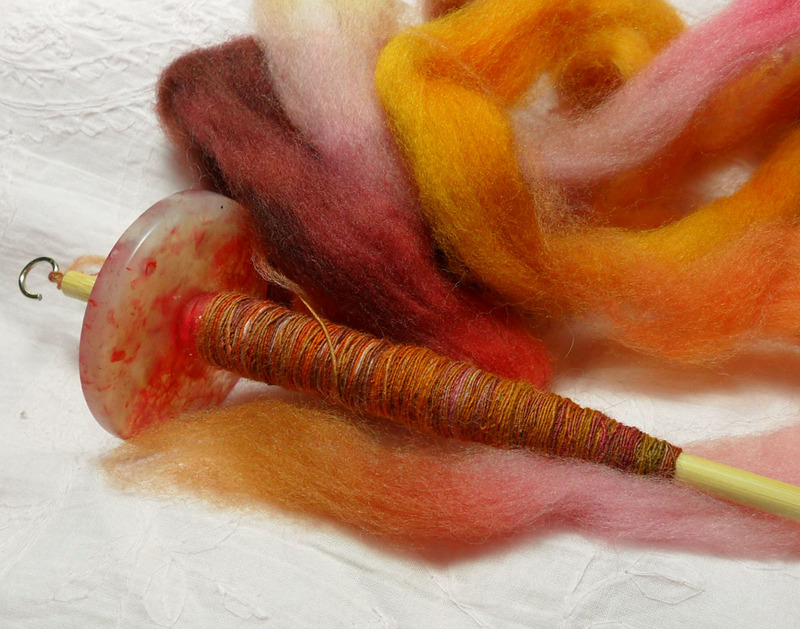 As a newish spindler, I'm looking forward to practicing my skills, and being inspired by a lot of like minded people. My only light weight spindle is involved in a WIP, (it is one of my tour goals to complete this as well) so I had to make a spindle before I could start! A cheapie 6mm bamboo knitting needle, agate donut, rubber band, pencil grip and brass hook later, I have a spindle which looks quite pretty, and much to my amazement, spins beautifully! The roving is 'Kenya' a Maude & Me colourway purchased from Spun Out.